Morris Bullock leads a multi-institution team at the Center for Molecular Electrocatalysis. 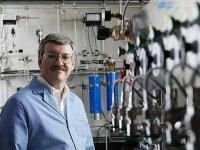 The Department of Energy's Pacific Northwest National Laboratory will be home to one of 46 new multi-million-dollar Energy Frontier Research Centers announced earlier this week by the White House in conjunction with a speech delivered by President Barack Obama at the annual meeting of the National Academy of Sciences. The EFRCs, which will pursue advanced scientific research on energy, are being established by the DOE's Office of Science at universities, national laboratories, nonprofit organizations, and private firms across the nation. "As global energy demand grows over this century, there is an urgent need to reduce our dependence on fossil fuels and imported oil and curtail greenhouse gas emissions," said Secretary of Energy Steven Chu. "Meeting this challenge will require significant scientific advances. These Centers will mobilize the enormous talents and skills of our nation's scientific workforce in pursuit of the breakthroughs that are essential to make alternative and renewable energy truly viable as large-scale replacements for fossil fuels." The 46 EFRCs, to be funded at $2 to 5 million per year each for a planned initial five-year period, were selected from a pool of some 260 applications received in response to a solicitation issued by the DOE's Office of Science in 2008. Selection was based on a rigorous merit review process utilizing outside panels composed of scientific experts. The DOE plans to award $22.5 million over five years for PNNL's new Center for Molecular Electrocatalysis, which will be led by PNNL chemist Morris Bullock. The Center comprises more than a dozen researchers from PNNL, the University of Washington, Pennsylvania State University and the University of Wyoming. The Center is expected to receive $4.5 million in its first year. "This is fantastic," said Doug Ray, PNNL associate laboratory director for fundamental and computational sciences. "The Center for Molecular Electrocatalysis will enable a group of outstanding scientists to focus on grand challenges recently identified by the Department of Energy as critical to controlling chemical transformations for energy applications." PNNL was also a partner on two other centers—one led by the University of South Carolina on nanomaterials and the other led by the University of Notre Dame on materials containing radioactive elements such as plutonium and uranium. PNNL's partnership with the UND center will involve the use of equipment at EMSL, DOE's Environmental Molecular Sciences Laboratory on the PNNL campus. At PNNL's Center for Molecular Electrocatalysis, Bullock and colleagues will study molecules called catalysts that convert electrical energy into chemical bonds and back again. Of interest are catalysts that pack energy into bonds involving hydrogen, oxygen or nitrogen. These reactions are at the core of technologies such as solar energy and fuel cells. For example, a catalyst breaks down chemical bonds to produce electricity in a fuel cell. A fast, efficient catalyst produces more power from fuel than a slow one—and fuel cells for vehicles need to release energy as fast as the explosions in a gasoline engine do. In previous work, PNNL scientists copied a feature called a "proton relay" from fast and efficient enzyme catalysts found in nature. The proton relay gave their synthetic catalyst speed comparable to natural catalysts. The new Center will help them better understand and control the reactions in such catalysts to make them not just fast, but efficient as well. "We hope to learn how to apply these principles to design a broader range of catalysts for energy applications," said Bullock. "This funding will allow us to gain a critical mass of researchers to attack this problem." Of the 46 EFRCs selected, 31 are led by universities, 12 by DOE national laboratories, two by nonprofit organizations, and one by a corporate research laboratory. The criterion for providing an EFRC with Recovery Act funding was job creation. The EFRCs chosen for funding under the Recovery Act provide the most employment for postdoctoral associates, graduate students, undergraduates, and technical staff, in keeping with the Recovery Act's objective to preserve and create jobs and promote economic recovery. However, PNNL's center will not be funded by the Recovery Act but by regular DOE funds.